History: (The Return of Dr. Fu-Manchu - BTS) <1916> - Yen-Sun-Yat of the Seven provided assistance to the Reverend J.D. Eltham, earning the reverend the wrath of Fu Manchu as he attempted to learn who the traitor within the Si-Fan was. Yen-Sun-Yat was ultimately executed by the Si-Fan in China. (Si-Fan Mysteries) <1917> - Fu Manchu and Ki-Ming were both revealed to be members of the Si-Fan's Council of Seven, and attended a gathering of the Si-Fan-- including the Seven-- in England, in which Fah Lo Suee was presented to the Si-Fan. (The Daughter of Fu Manchu) <1930> - The Council of Seven convened at El-Kharga, Egypt, under the direction of Fah Lo Suee, and with Sheik Ismail and Ki-Ming in attendance, along with members and staff which included two Afghani Thugees, three Dacoits, two Phansigars, one European, and two Tibetan monks. The meeting was infiltrated by Shan Greville and Nayland Smith, disguised as the Tibetan monks, but they were discovered. Leadership of the Seven was ultimately restored to Fu Manchu. (President Fu Manchu) <1936> - Ahmed Fayume of the Seven was present in New York during Fu Manchu's attempt to control the U.S. election. He was detained by Nayland Smith, but was released due to lack of evidence. Fu Manchu's long-time ally Sam Pak was also revealed to be one of the Seven, but was likewise unable to be charged. (The Drums of Fu Manchu) <1939> - The Council of Seven ordered the deaths of the fifteen men who could cause World War II to breakout, and many of these were killed while some, such as Pietro Monaghani submitted to the Si-Fan and were spared. (The Shadow of Fu Manchu) <1948> - The Council of Seven offered a position to Dr. Morris Craig, inventor of the transmuter disintegrator weapon, but Craig turned them down. The Si-Fan sought to obtain the device by other means. (The Wrath of Fu Manchu) <1952> - The Council of Seven (Fah Lo Suee, Emir Abdulla al-Abbas, Sir Mostyn Bierce, Dr. Griswal, Colonel Otto von Seidler, Selwyn Orson, and Captain Cooper) held a meeting in Manhattan. Unknown to them, Orson was actually an FBI agent. All but Fah Lo Suee were rounded up and captured by Sir Denis Nayland Smith and Raymond Harkness. 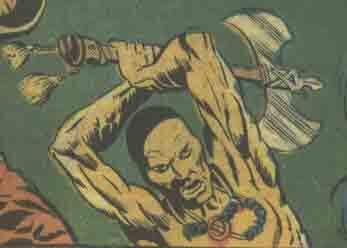 (Giant-Size Master of Kung Fu#1) - On the birthday of his son Shang-Chi, Fu Manchu dispatched the Council of Seven as assassins to kill Shang, announcing each attempt to their intended quarry with a sawdust mannequin dressed in Shang's garb. The first pair of assassins attacked Shang with a knife and nunchuks, but he beat them, and they took poison capsules rather than face Fu Manchu's wrath. Fu assigned two more members to the Seven and continued. Another attacked Shang with a mace, but failed and took his life. A female member allowed herself to be struck by a shuriken to gain Shang's trust; the member who threw the shuriken was caught by Shang and took his life, and the female member also failed to kill him. Shang snuck into Fu Manchu's New York base and knocked out two of the Seven, then placed their robes over himself and one of the sawdust dummies so that he could sneak into their meeting. When he revealed himself before Fu Manchu and the remaining Seven, he engaged them in combat, and the rest of the Seven were defeated. It is not known whether they took their lives as the others had done. (Master of Kung Fu I#27) - Seven new members were assigned to the Council and attended a meeting with Fu Manchu in which he informed them of the civil war brewing within the Si-Fan due to the schemes of Fah Lo Suee. The meeting was interrupted by Shang-Chi, and the Seven fought him, only to meet defeat. Adapted by Doug Moench, Paul Gulacy, and Dan Adkins. 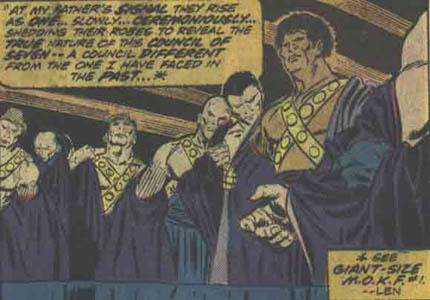 Although the Council of Seven were master planners and schemers in the novels, they were interpreted as martial artists in the Master of Kung Fu comics; more befitting the concept, of course. 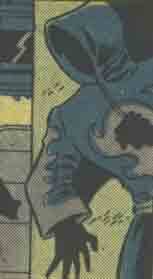 The third assassin also appeared in a pin-up in Deadly Hands of Kung Fu#4. The first and second Si-Fan assassins from the Council of Seven attacked Shang with a knife and nunchuks. When they failed, they took their lives with poison capsules rather than face Fu Manchu's wrath. 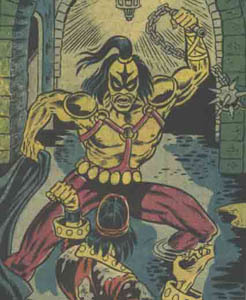 The third Si-Fan assassin from the Council of Seven attacked Shang with a mace, and dragged him down a manhole cover to fight him in the sewers. When he failed, he took his life with a poison capsule rather than face Fu Manchu's wrath. The fourth Si-Fan assassin from the Council of Seven was not seen without his robes. He threw a shuriken at the fifth assassin so that she could attempt to lower Shang's guard around her. 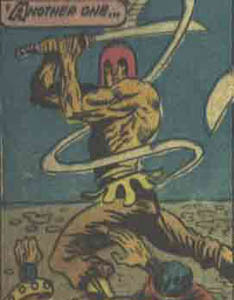 Shang caught up to the fourth assassin, and he took his life with a poison capsule rather than face Fu Manchu's wrath. The fifth Si-Fan assassin from the Council of Seven was a beautiful woman. She allowed herself to be struck with a shuriken from the fourth assassin so that Shang would lower his guard around her. Shang brought her to her apartment to help her bandage the wound, and she pretended to seduce him in an attempt to wrap a garotte around his throat. Shang threw her off by strangling her with her own hair. When he released her, she leapt out the apartment window to her death rather than face Fu Manchu's wrath. 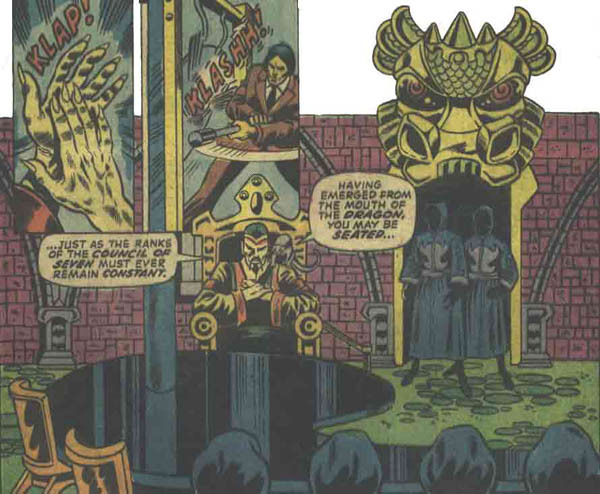 The remaining Council of Seven members gathered at Fu Manchu's New York base for a meeting, but Shang-Chi ambushed two of them and placed their robes over himself and a sawdust dummy so that he could infiltrate their meeting. 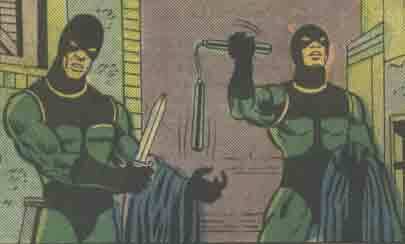 Shang-Chi attacked the Seven at their own meeting, and bested the remaining five members. It is not known whether or not they took their lives for their failure. The next Council of Seven attended Fu Manchu's briefing on the Si-Fan's civil war due to Fah Lo Suee, but were interrupted by Shang-Chi. They fought Shang using spears, maces, swords, shuriken, staffs, axes, and daggers, but he bested all of the Seven. It is not known whether they took their lives for their failure.